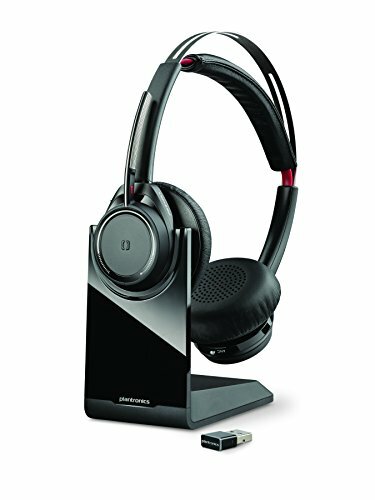 tl:dr; If you are looking for the best wireless headset for making video calls when working for home, this is the best headset to get. Great sound. Comfortable to wear. Connect to computer and phones seamlessly. There are cheaper wired USB headset. But wireless headset let me stand up and walk around, go get a cup of coffee, all without missing anything. And no cord to get tangled. Not all bluetooth connects are the same. It is hard enough to talk and listen over a video link. I want to sound good and clear so that people on the other end can hear me. Most high end headset has good sound, including the Jabra evolve and Apple AirPods. Most smaller headsets, like the AirPods, last only an hour or so with constant use. There is nothing more annoying then having to switch headset during a call. I need something that has at least 4 hours of realistic talk time. Using a headset several hours a day is not comfortable. Most in ear headsets are out with the exception of the AirPods. Pressure in the ear canal is never good. On ear headset is actually more comfortable than over the ear for someone who wear glasses. Weight and head band design also matters. 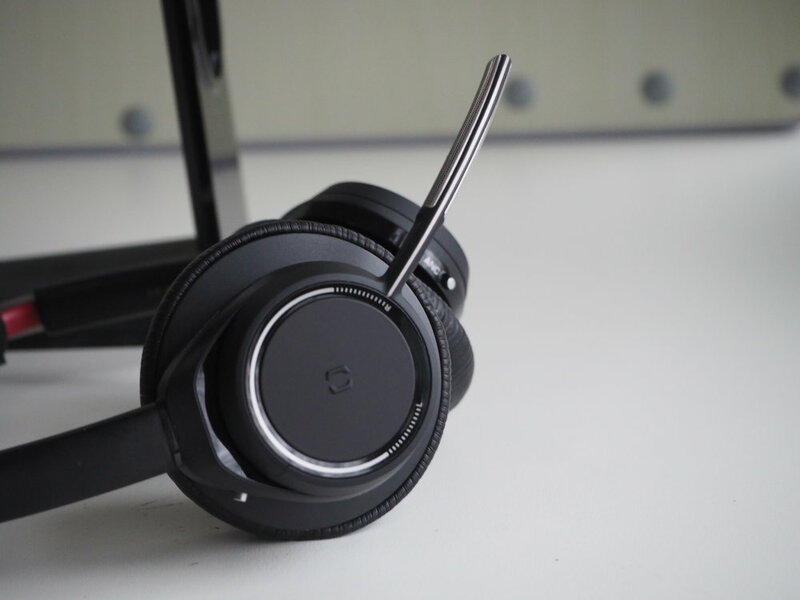 The voyager, being a full size headset, has great battery life. It is rated at 12 hours talk time. I have never ran out of battery during a day’s worth of conference call. 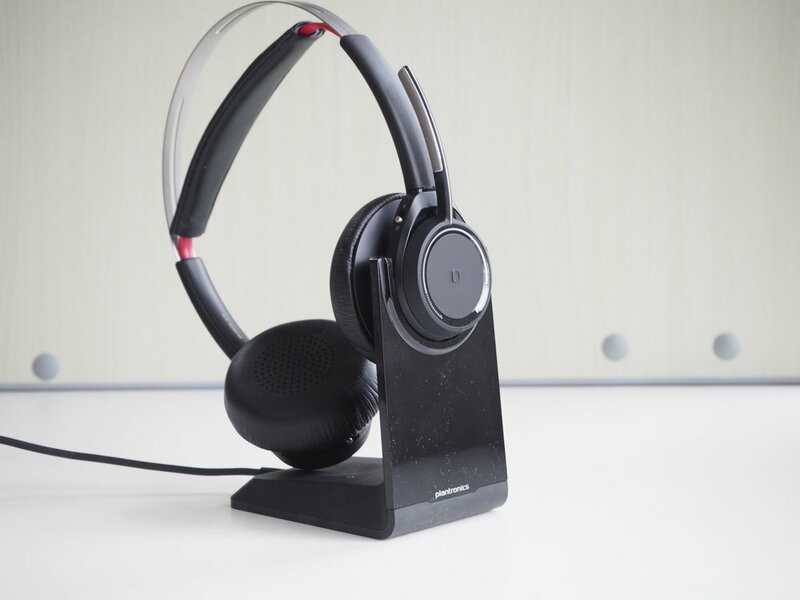 Because it comes with a easy to use charging stand, charging the headset overnight is easy to do. No trying to figure out the right direction to plug in a micro USB cable. Although you can charge it using USB as well, especially if you are on the go or in a hotel. The headset comes with a soft slightly padded carrying case. The Voyager connects to my iPhone XS using standard bluetooth 4.1, but connect to my MacBook Pro 2017 using a proprietary adapter/dongle. I attach it to a USB-A to USB-C adapter and plug that into my MacBook Pro. Initially I thought this will be a hassle. But the dongle has a useful LED light that tells me the connection and mute status. I grew to like it. The headset switch seamlessly between my iPhone and my Mac. I find that I need to give the headset a few seconds to get connected. Do not flip the boom mic down until it is connected to both the phone and the computer. It has audio status to tell me that it is connected. The on-ear earpads are comfortable. The clamping force is very low. The headband is a suspended design that put very little pressure on the top of my head. 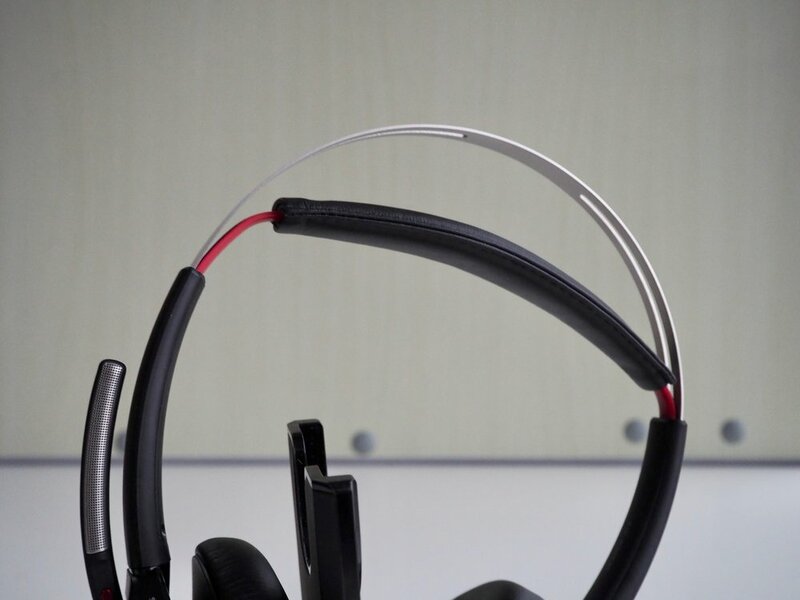 The elastic suspended design also means the headset will not go out of adjustment. I like the physical on/off and pair switch. It is easy to locate. Easy to use. The control groupings are intuitive: All media control is on one side, including volume, track next/pre, play and pause. The other side is the mic boom, and the power and answer control. On the boom itself is the mute switch. While there are many physical switches, they are sensibly grouped. 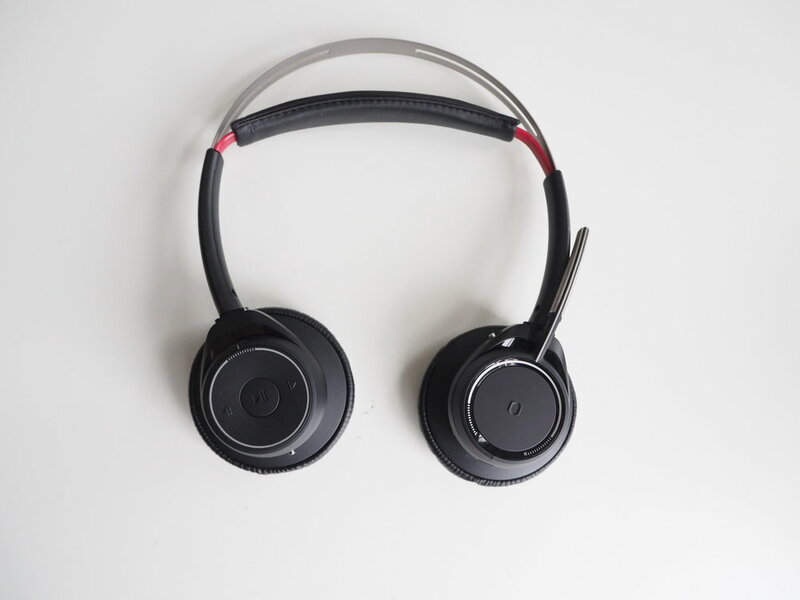 Ambidextrous design: You can actually wear the headset with the mic boom on left or right. The headset can tell and will route the left and right channel accordingly. Smart huh? However it does not switch the volume “Knob” direction. So depending on which side is the volume “knob”, forward can means louder or softer. The headset has a smart sensor. When you remove the headset from your head, it will pause music playback. It works with all audio app on my iPhone, and native music apps on my Mac, like iTunes. It will not pause a video playing inside a browser. There is a plantronics app call PLT Hub on iOS, and a Plantronics Hub app for OSX on the Mac. both are free software. 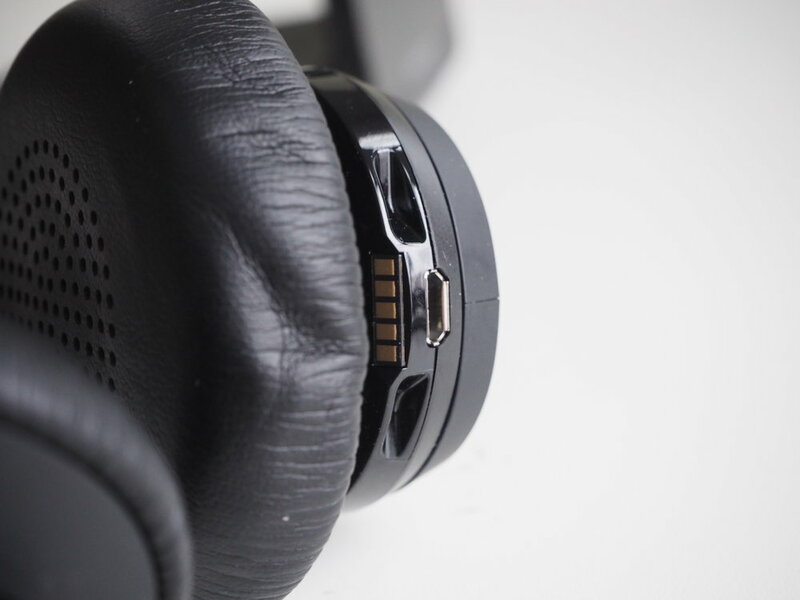 They allow customization of various things on the headset and the connection dongle. The Voyager is the best after I tried several other types and brands. The Apple AirPods win on comfort, sound and compatibility, but fails on battery life. I had to charge one earbud after the other during a call to keep going during the day. 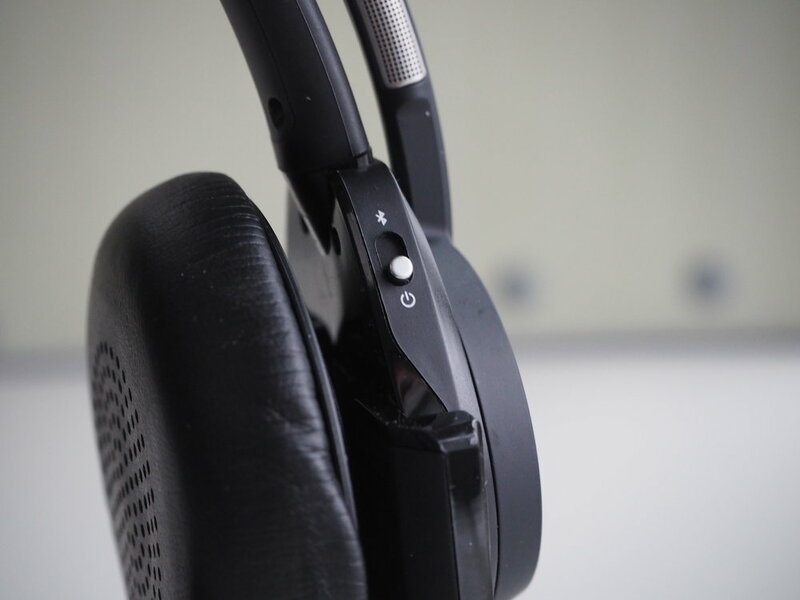 I tried the Jabra Evolve 65e neckband style headphones. The mic quality is great, but it is uncomfortable for my ear, and the bluetooth implementation does not work well with the Mac at all. In fact their support document says it is only designed for mobile use. This headset is not cheap. But for the number of hours I use it each day, it is easily one of the best gadget purchase.